General Motors' efforts to sell Hummer to a little-known Chinese company have fallen apart, the U.S. automaker announced on Wednesday. As a result, GM will begin to dismantle a brand of gas-guzzling SUVs that was synonymous with prefinancial crisis wealth and excess. Specific reasons for the failure of the deal, first announced last June, were not released. But Chinese regulators had frowned on the purchase for much the same reasons that U.S. consumers shunned the Hummer: the vehicle's size and poor fuel economy were impractical in an era of high fuel prices, general economic weakness and greater concern about the harmful effects of vehicle emissions on the environment. The Chinese government also wants to control a sprawling domestic auto industry that has expanded to include more than 100 carmakers. The purchase of Hummer by Sichuan Tengzhong Heavy Industrial Machinery, a private company that manufactures heavy vehicles and road-building equipment, would have only contributed to the diffusion. "The purchase of this brand is not a match for China," says Yale Zhang, a China market analyst for auto-industry consultants CSM Worldwide. "The government's general policies about efficiency and environmental protection, and No. 2, about consolidation  it is all about these two very broad, general policies. This purchase does not match those." The Chinese company had indicated that it wanted to put the Hummer on a diet and produce a leaner, more fuel-efficient version of the behemoth vehicle, which topped out at 15 m.p.g. for the once popular 2½-ton H3 model. 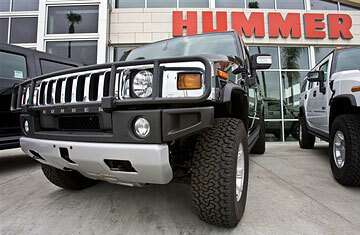 A descendant of the U.S. military's humvee, which was built by AM General, the Hummer peaked in popularity in 2006, when GM sold more than 70,000 of the vehicles. By last year, sales had fallen to 9,000. GM first put the brand up for sale in 2008, hoping to raise as much as $500 million. The Tengzhong offer was estimated to be closer to $150 million. "We have since considered a number of possibilities for Hummer along the way, and we are disappointed that the deal with Tengzhong could not be completed," John Smith, GM's vice president of corporate planning and alliances, said in a written statement that was released on Wednesday. "GM will now work closely with Hummer employees, dealers and suppliers to wind down the business in an orderly and responsible manner." Over the past year, China has encouraged the sale of economy cars. As part of its stimulus efforts, the government halved taxes on vehicles with engines smaller than 1.6 L. Combined with the relative health of the Chinese economy, car sales soared. In 2009 mainland consumers bought more vehicles than their American counterparts, making China the world's largest car market for the first time. Even so, the Hummer was a little too big for their taste. See the most important cars of all time.